A cup o’ joe from your local coffee shop may give you a much needed caffeine fix, but if you love and enjoy a quality cup of coffee brewed at home, then a coffee grinder is a necessary kitchen tool. Coffee grinders can grind any of the whole bean varieties to give you the exact amount of the freshest ground coffee you need at a time. 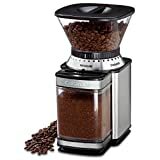 If you’re looking for a coffee grinder to give you ground coffee just the way you like it every morning, then this guide will give you all the answers to find what you need. 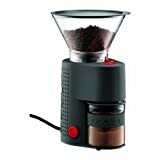 Electric burr grinders: Burr grinders have two gears (either wheel or conical) that crush coffee beans to create a smooth, even grind. Burr grinders are quieter than blade grinders and usually feature a ceramic burr that maintains its sharpness longer. They have the most exact coarseness specifications and create the smoothest ground coffee in a steady, powerful manner. Hand (manual) grinders: Hand grinders feature a hand crank and a conical blade that are ideal if you have limited counter space, want to brew small amounts of coffee at a time, or don’t want the noise of an electric grinder. Hand grinders are great for espresso machines, drip, and finer french presses. They can also double as spice grinders. Hand grinders make finer, smoother ground coffee in small quantities. Electric blade grinders: Electric blade grinders use spinning blades attached to a motor to slice coffee beans into smaller and smaller pieces. They are the most cost-efficient of the electric grinders. Cleaning: Burr grinders have removable parts which make them the easiest grinders to clean and subsequently they are reviewed higher. Consumers also preferred grinders that come in dark exterior colors because coffee beans can easily stain or discolor the machine. Operation: Consumers prefer machines with auto-off functions that stop the grinders when they reach the desired coarseness. This is ideal for consumers who don’t want to keep an eye on the machine at work. The best reviewed coffee grinders are also the ones that manage to grind with minimal noise and vibrations on the countertop. If this is a concern for you, choose a hand grinder or an electric grinder that has conical burrs to minimize disruption. Durability: Some reviews boast of coffee grinders that last several years, working as well now as when it was brand new. Owners were most satisfied with conical or stainless steel materials for lasting the longest and being the most durable. 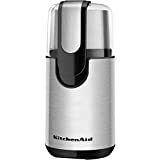 Functionality: Reviewers love their hand and blade grinders that can also grind spices and seeds as they enjoy the double functions their coffee grinders can easily serve in the kitchen. If you want more out of your grinder, look for a top brand that can grind a host of things, giving you more function for your money. Consider the mechanics of a coffee grinder when buying. Blade grinders with stainless steelblades are of the highest quality and will last the longest. If you’re choosing a burr grinder, then you have the choice of wheel or conical burrs. Wheel burrs are round, flat grinders that spin quickly. Conical burrs are cone-shaped and spin slower than blades, but they are relatively quiet and do not clog as easily as other models. Electric coffee grinders have varying levels of power. Grinder power is measured in watts, and they usually have wattages ranging from 150-300 watts. The higher end coffee grinders will be closer to 300 watts and will withstand more grinding cycles. This will contribute to the longevity and durability of your coffee grinder, as well as its ability to give you a better blend. It’s important to know that faster is not necessarily better. Keep an eye on the speed of a coffee grinder because while it can be convenient to have one that works quickly, the heat can affect the taste and quality of coffee. Coffee grinders that grind consistently at a steady speed will deliver the best results. Look at different coarseness settings to serve the purposes you need. Not all grinders offer different settings, and some have more than others, so take into account what levels of coarseness you need. Turkish coffee should be ground into miniscule granules, but French roast can be ground at a coarser setting. Make sure the coffee grinder you are buying fits the types of coffee you plan to use it for. Coffee grinders come in a variety of sizes with capacity for different quantities of coffee. 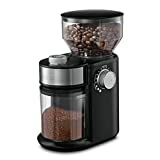 Since coffee grinders are intended to make only the coffee you need for a few days to maintain freshness, you should buy a coffee grinder based on the capacity you realistically need. If you don’t want to have to watch the coffee grinder while it works, then look for one with coarse control. This will ensure that the coffee grinder will shut off automatically when it reaches the desired level of coarseness. KRUPS: Since 1846, KRUPS has been working to deliver the perfect coffee through products and accessories. ‘Precision and technical perfection’ were a ‘firm promise’ of founder Robert Krups. The company has been producing electric coffee grinders since 1961. Cuisinart: Since its founding, Cuisinart has a longstanding reputation of award-winning kitchen products and designs. They specialize in a wide variety of products preferred and endorsed by a number of renowned chefs. Capresso: Jura-Capresso, Inc. is the result of a merger between the Swiss company Jura AG and Capresso. Together, the company now represents some of the foremost coffee products, from the automatic coffee centers of Jura AG to the grinders, kettles, and espresso machines of Capresso. Mr. Coffee: Founded in Cleveland, Ohio in 1972, Mr. Coffee revolutionized the coffee making world with automatic drip coffee makers, products, and accessories.